Carlton T. "Heavy C" Winters entered into rest September 28, 2018, at Buffalo General Hospital after a lengthy illness. Born August 26, 1971 he was the son of Mary (Winters) Stamp and the late Carlton "General" Winters. 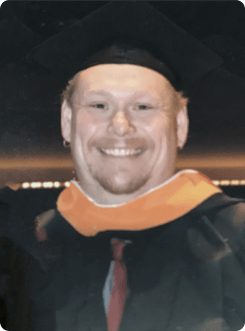 Carlton graduated from Lockport High school in 1989, attended NCCC for accounting and criminal justice and graduated from D'Youville College to become a Registered Nurse. He currently worked at E.C.M.C and was enrolled at Chamberlain University to become Nurse Practitioner. Beloved Father of Brian, Albert and Trina Winters, Ashley Hunt, Brianna and Jacqueline Larson. Beloved Fiance of Jennifer Larson. Cherished son of Mary Stamp and the late Carlton Winters and David Stamp. Best friend of Courtney Campbell, Tony Heary and Jennifer Bragg Bennion. Dear Uncle of Carter. Also survived by Aunts, Uncles, Cousins and Dear friends. Friends may call from 6-8 on Tuesday and Wednesday at the Taylor and Reynolds Funeral Home, 70 Niagara street, where the Funeral Service will be held 8:00 pm Wednesday. Inurnment in Orangeport cemetery. Condolences may be offered below, and flowers may be purchased through The Flower Barn.